The hunger strike in Chicago by parents and their allies at Dyett High School in the Bronzeville neighborhood has passed Day 31. The hunger strike at Dyett is not an isolated incident of disgruntled parents and community members; it is part of a grassroots movement to challenge corporate school reform, which evaluates and punishes students, teachers, and schools based on standardized test scores. The efforts of Dyett parents and grandparents in Bronzeville are joined with other acts of defiance throughout the country: parents withholding their students from standardized tests, teachers burning their evaluations and refusing to administer tests that they deem harmful, students walking out of school to protest the test and punish regime, communities fighting against the privatization of their public schools. The hunger strikers in Chicago join with other courageous hunger strikers throughout the world who have sought to dramatize injustice through self-sacrifice. What makes this struggle especially inspiring is that not only is the community opposing unjust treatment, it is working to effect an alternative that is the product of grassroots deliberations about the kind of school and the kind of education their community’s children deserve. We also note that at a time when the world urgently needs to abandon the use of fossil fuels, the revitalization of Dyett school that parents and the community is fighting for includes a commitment to green technology. This struggle is about much more than the 12 parents and community leaders in Bronzeville. It is about the kind of schools we want our children to attend. And it is a fight for democracy: that the future of public education should be in the hands of the public — not controlled by wealthy corporations and their foundations. We call on you to act swiftly to avert the further harm that can befall the 12 parents and community leaders from Bronzeville and allies from communities across Chicago who have been on a hunger strike for 31 days. The fight for Dyett has raged since CPS decided to convert a highly-successful middle school to a high school over a 3-month period in 1999. Horrified by the inability of the first graduating senior class in 2003 to experience college prep or advanced placement classes or a full-time librarian; community members began to invest in the school through the local school council to infuse critical programs and neighborhood partnerships into the building. The fruits of that labor yielded the highest increase in students attending post-secondary institutions in 2008, and the highest decrease in out-of-school suspensions and arrests in 2009. Despite steady significant gains, the Mayoral-appointed Board of Education members voted to phase-out the school in 2012; and the mass erosion of investment to prepare those students for success. Galvanized by this injustice and emboldened by their record of success, parents and concerned residents began to work with educational experts within Chicago and around the country to develop an academic plan based on the community wishes. Through a series of focus groups, town hall meetings, and extensive consultation with community and educational institutions, the Dyett Global Leadership and Green Technology academic plan was developed. Some of the same experts who have developed Level 1 high schools in Chicago led the design team that created this plan in direct consultation with the community over a 4-year period. Neither of the competing proposals for Dyett come close to this level of community engagement or expertise. Bronzeville has spoken. We have engaged over 3000 Bronzeville residents who see the need for Dyett Global Leadership and Green Technology High School. One of the challenges facing African American parents and students in Chicago is the lack of response and accountability from elected and appointed officials. Affluent neighborhoods receive selective enrollment and well-resourced schools. However, communities comprised of predominantly low-income and working families have to contend with under-resourced schools and privatization models that undermine the integrity of the community. We compel you to act on behalf of the residents of Bronzeville who have been rendered voiceless in this process. Originally published at www.tikkun.org on September 16, 2015. My partner has been a public school teacher for the better part of the last 16 years. Every year at this time, he gets preoccupied with the emotional, mental, and physical work of getting ready to start the school year. Over time, this focused preparation has become more and more marked by anxiety. Year by year, since 1999 when he first started teaching, resources have been slowly stripped. Rather than being able to apply his expertise to constantly improve the learning experience of his students, each year he must instead face one more new barrier to giving his kids the education they deserve. At different points he has had to give up planning periods, lunch breaks, his classroom. He moved from teaching all 600 kids in 5 days to seeing them all in 4 days two years ago. He has never had an adequate budget for basic supplies like pencils, paper, paper towels, markers, or books – we have always paid, from our family budget, to make sure his students have what they need. Many of our closest friends are teachers and they face the same thing. All over the country, teachers are bracing themselves. Not because they don’t love teaching. Not because they don’t love their students. Actually, it is because they DO love their students and they want to do the best the possibly can by them. Many teachers I know dreamed and worked towards being a teacher from high school or college – they are consummate professionals, always striving to improve and excel. Always trying – and often succeeding – to do the best they can DESPITE the conditions they face. Every teacher I know has asked themselves – can I really do this, under these conditions? Am I doing the right thing – for my students and my family and myself – to go back to teaching in the form it has taken after years of budget cuts and austerity? Many have made the extremely difficult decision to leave the profession they loved and put time, money, and years of preparation into. I just wanted to say that I see you. I see you struggling mentally, physically, and emotionally. It feels like a battle because it actually is a battle. We are fighting for our schools. We are fighting for our children. We are fighting for a future in which our children are educated in a way that builds their self love, their intellect, hones their brilliance, and prepares them for living. We are fighting because public education is under attack. Sending love and thanks to all of the school workers out there getting ready to go in for our kids. Her husband, Todd Warren, is a Spanish teacher in North Carolina and an activist for teachers. P.S. Enjoy 30% on purchases through 8/31/2015! Use code: SchoolH15b! Jesse Hagopian is a Rethinking Schools editorial associate and editor of “More Than a Score” published by Haymarket Books. Jesse Hagopian is a Rethinking Schools editorial associate. While I was recently in Boston speaking about my recently released edited book, More Than a Score: The New Uprising Against High-Stakes Testing, I had the wonderful opportunity to meet with the great EduShyster, who asked me important questions about the connection between the resent rise in student protests against police brutality and high-stakes, standardized testing. 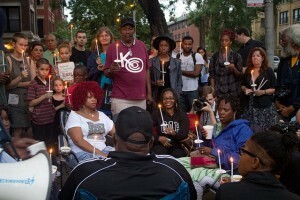 EduShyster: You happened to be in Boston recently giving a talk about the new uprising against high-stakes testing on the same night that thousands of people here were protesting police violence and institutional racism. Here’s the people’s mic—explain how the two causes are related. Rethinking Schools Note: Wayne Au is a Rethinking Schools editor and author. In 2014 he edited the second edition of Rethinking Multicultural Education and in 2012 he co-edited Pencils Down: Rethinking High Stakes Testing and Accountability in Public School. 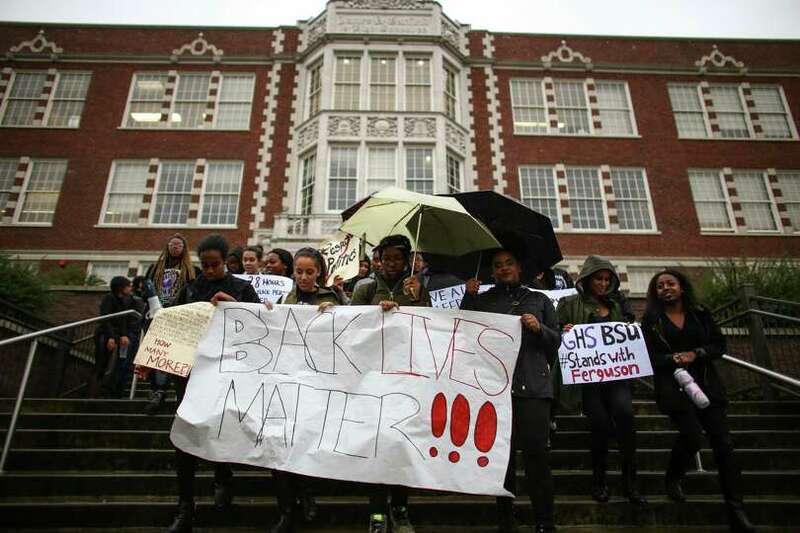 In January 2013, teachers at Seattle’s Garfield High School sparked an already-growing movement over standardized testing in the post-No Child Left Behind era. They announced that they were boycotting the district-mandated Measures of Academic Progress, or MAP test, a move that was initially met with threats from the school’s administration. Almost immediately, support for the teachers started pouring in, from near and far, from other educators, schools, and districts, and from unions, parents, and students. Wayne Au, a scholar of social justice in education, in his office at the University of Washington Bothell. Wayne Au, a former high school teacher, graduate of Garfield and Evergreen, and professor of education at the University of Washington Bothell, was an early and influential backer. Au is the author of Unequal by Design: High Stakes Testing and the Standardization of Inequality and co-editor of Pencils Down: Rethinking High-Stakes Testing and Accountability in Public Schools. Within days, he posted an insightful blog about the boycott on the website of Rethinking Schools, a social justice education journal he helps edit. Au is recognized nationally as a scholar of social justice in education. He’s written and spoken publicly about such issues as multiculturalism in education, the problems with using standardized testing to evaluate learning and teaching, and public funding of charter schools. And he’s not only voiced solidarity with activists in their struggles to better their schools, but also informed them with his prolific work. Professor Au teaching a bridge class of freshmen transitioning into college. His articles have been published in both academic journals and popular media outlets. He’s written two books and edited or co-edited six more, including the upcoming Mapping Corporate Education Reform, an analysis of the key actors influencing policy, which will be released next spring. He’s also contributed curriculum to several projects focused on social justice teaching, including The Zinn Education Project, Beyond Heroes and Holidays, and Putting Movement Back Into Civil Rights Teaching. Au became a teacher to change the world. At an early age, he saw teaching as a powerful way to make a difference in the lives of others. “I knew I wanted be a teacher in ninth grade at Garfield,” he said. He also believes that the arena of public education—where he obtained his elementary-to-doctoral schooling—holds great promise in promoting equity and positive social change. First-generation students working together on an assignment in Au’s bridge class. Au earned his bachelor’s and Master in Teaching degrees at Evergreen in 1994 and 1996, respectively. During his time at the college, he was an Upward Bound tutor to at-risk high school students preparing for college. Afterward, he was a social studies and language arts teacher at South Seattle Community College’s alternative Middle College High School. He then taught language arts and African history at Garfield, his alma mater, before relocating to California, where he worked at Berkeley High School, teaching social studies, language arts, ethnic studies, and Asian-American studies. In Berkeley, he was active in the Education Not Incarceration Coalition, which opposed California’s plan to cut education funding while increasing monies to state prisons. Schools lost in the state’s final budget, and he was laid off, prompting him to pursue a career in higher education. The Garfield boycott didn’t end testing, but it was a seminal event in a larger grassroots movement. “In the broader struggle over how people understand education policy and practice, symbolic victories are critical to winning future fights,” says Au, who’s gearing up for battles ahead, including over Common Core testing and Initiative 1240, Washington’s Charter School Act. With assets of more than $80 billion, the Koch brothers, who control Koch Industries, are together richer than Bill Gates. 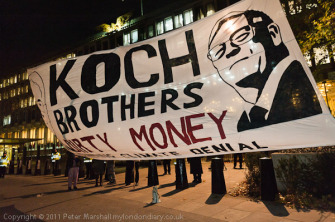 As a recent Rolling Stoneexposé (“Inside the Koch Brothers’ Toxic Empire”) by investigative reporter Tim Dickinson details, the Kochs made that money largely by polluting the Earth and heating up the climate, with massive oil and gas holdings. And through their network of far right foundations and front groups, they lobby for policies and fund politicians in line with their free market, fossil fuel interests. 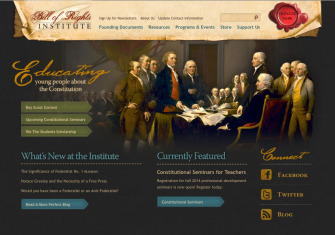 The Bill of Rights Institute is funded by the Charles Koch Foundation, the Fred and Mary Koch Foundation, and David Koch. Bill Bigelow is curriculum editor of Rethinking Schools magazine and co-director of the Zinn Education Project. He co-edited the just-released A People’s Curriculum for the Earth: Teaching Climate Change and the Environmental Crisis. This article is part of the Zinn Education Project If We Knew Our History series. Jesse is an editorial associate at Rethinking Schools. Sign the Save Recess Petition today! You have heard about Seattle’s fight for a $15 minimum wage, or the teachers who organized a mass boycott of the MAP test. But you might not be aware of the newest movement–organized for one of the most basic human rights–that was recently ignited in the emerald city: The struggle for the right to play.